Dubai, 29 April 2015 – An art commission of a lifetime has been awarded to a young UAE-based artist and featured at the Dubai International Arabic Calligraphy Exhibition. 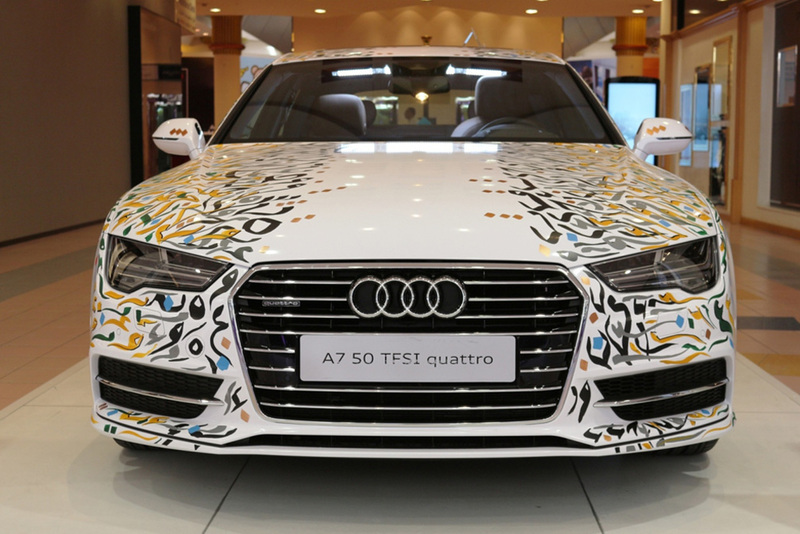 Iraqi-born Canadian artist Reem Al Rawi was chosen to design intricate Arabic calligraphy exclusively for an Audi A7 from Al Nabooda Automobiles and painted the letters onto the luxury car in front of shoppers and art lovers at a three-day event in Wafi Mall, Dubai. Organised by the Dubai Culture & Arts Authority (Dubai Culture), the 8th edition of the Dubai International Arabic Calligraphy Exhibition has grown in popularity as the burgeoning arts scene develops in Dubai. The decorated A7 is now available to view at Wafi Mall until 15 May. As part of Al Nabooda Automobiles’ support of the exhibition, the exclusive Audi distributor in Dubai and the Northern Emirates also supplied a fleet of Q7s and A8s to transport VIPs and guests of the event around the city.